The Oregon legislature recently adjourned its 2018 session and once again took no action to reduce the long-term financial obligations of the Oregon Public Employee Retirement System. Conventional wisdom in Salem is that significant pension reform is impossible, so we should just quietly accept our fate that the PERS crisis will lead to layoffs at public schools and other service providers. The Portland regional transit district, TriMet, is not part of PERS and has been slowly reforming its pension program since 2002. As a result, 100 percent of all new employees are now in 401(k)-style pensions that have no long-term liabilities for employers. These are referred to as “defined-contribution” pensions in which monthly payments are made by management into personal accounts owned by employees. Once those payments are made, the employer has no further financial obligations. This stands in contrast to “defined-benefit” programs like PERS in which employees are promised various levels of retirement payments calculated through arcane formulas that leave management clueless about the major level of funding obligation they’ve agreed to. The advantages for taxpayers of moving public employees into defined-contribution pensions is now evident in the actuarial projections done for TriMet. 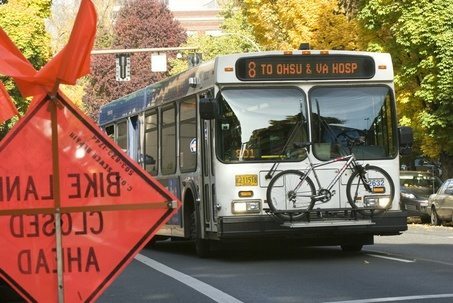 According to the most recent valuation, estimated annual benefit payments for TriMet defined-benefit pensions will peak in 2034 at $74.6 million, then drop to $24 million in 2060 and $6 million by 2072. They will hit zero by the turn of the century. This was not something that TriMet did casually. Management was forced into it because of decisions made in the 1990s that caused long-term retiree obligations to explode. The TriMet Board realized that changes were necessary and voted to move all new, non-union hires into defined-contribution pensions after 2002. Union leadership eventually agreed to move all new members to defined-contribution pensions by 2013. As a result, the number of active employees still accruing defined-benefit pension benefits fell from 1,580 to 1,460 during 2016. Last year, the unionized workers’ defined-benefit account reached nearly 80 percent funding; and the long-term, unfunded pension liability dropped by nearly $50 million. The defined-contribution plan to which TriMet moved new workers has been recognized as one of the best in the country. It features low costs, high returns, and a guaranteed employer contribution that is paid irrespective of employee matching contributions. TriMet’s pension reform offers a valuable guide to the Oregon legislature on how to contain and reverse the spiraling PERS disaster. The unfunded liabilities for PERS have grown from $16 billion to more than $25 billion in less than ten years. Some reduction in PERS benefits will have to happen, and all parties will benefit from an orderly transition while there is still time. The state should emulate TriMet by moving its employees from defined-benefit to defined-contribution plans as soon as possible. However, the legislature will be obliged to make bigger changes than would have been required years ago. It will have to move all current workers, whenever they were hired, to defined-contribution plans for all work performed after the date of the effective legislation. John A. Charles, Jr. is President and CEO of Cascade Policy Institute, Oregon’s free market public policy research organization. Scott Shepard is a lawyer who recently authored a new case study of TriMet’s pension reform for Cascade Policy Institute. The study, “Following in TriMet’s Tracks: Defined-Contribution Pensions a Necessary First Step to Oregon’s Fiscal Health,” is available here. A version of this article originally appeared in The Portland Tribune. Is TriMet Better Off Than Greece?